English author and communal worker; died March 31, 1863, at Liverpool. 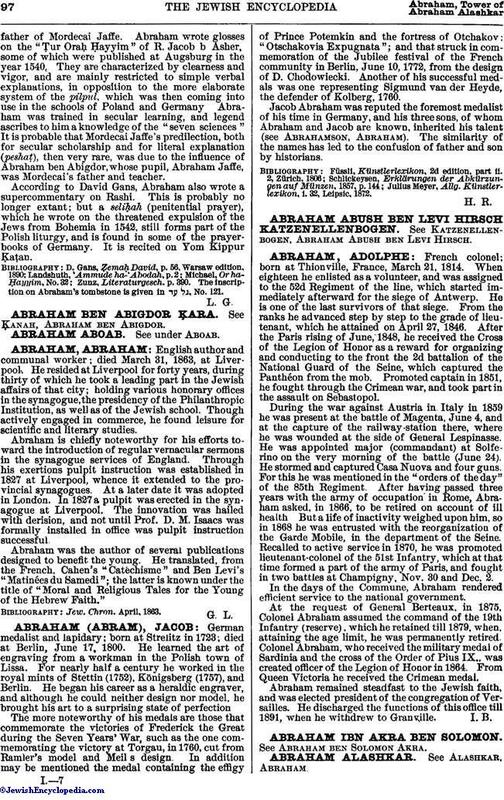 He resided at Liverpool for forty years, during thirty of which he took a leading part in the Jewish affairs of that city; holding various honorary offices in the synagogue, the presidency of the Philanthropic Institution, as well as of the Jewish school. Though actively engaged in commerce, he found leisure for scientific and literary studies. Abraham is chiefly noteworthy for his efforts toward the introduction of regular vernacular sermons in the synagogue services of England. Through his exertions pulpit instruction was established in 1827 at Liverpool, whence it extended to the provincial synagogues. At a later date it was adopted in London. In 1827 a pulpit was erected in the synagogue at Liverpool. The innovation was hailed with derision, and not until Prof. D. M. Isaacs was formally installed in office was pulpit instruction successful. Abraham was the author of several publications designed to benefit the young. He translated, from the French, Cahen's "Catechisme" and Ben Levi's "Matinées du Samedi"; the latter is known under the title of "Moral and Religious Tales for the Young of the Hebrew Faith."